I love all things Autumnal and the Indian Summer that Paris has been enjoying as the days of vacationing come to a close has made the seasonal transition that much more enjoyable. In the markets, vestiges of Summer are present in basil, squash, and green beans while cabbage, carrots, and leeks sneak their way onto center stage. Tucked away on a tree-lined square in the 14th arrondissement, the Marché Mouton-Duvernet is an ideal market to explore on an Autumn day. The market is small, but packs a lot in for the quaint space it occupies. Flower vendors are disproportionately present, but they cede space to other vendors (a jewelry maker and even a traveling book shop counts itself one of the Mouton-Duvernet market community). The majority of the veggie stands at Marché Mouton-Duvernet resemble each other in that they offer squeaky-clean and seasonally out-of-place products. The cheese and fish vendors are alike in that there is no clear attachment to local sources or sustainable practices, although one particular fromagerie did emanate that unmistakably fermented aroma that reminds you you are, indeed, in France and couldn't possibly be anywhere else. "I'm going for a beer", I heard from a man sitting at a vegetable stand tucked away in the corner of the market. Deciding that a quarter to 12 was 5 o'clock somewhere, the man stood from his folding chair where he was a behind-the-scenes audience to the market's only independent producer, Eric Credard. 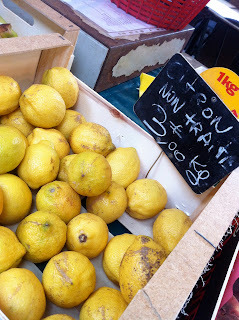 Credard's stand was a refreshing mix of all things seasonal including a selection of lemons that were proudly marked as "non traité", or untreated, "You can use the whole thing!" he told me as he bagged a handful of lemons for me and pointed out that being organic, I could feel free to enjoy the entire citron from zest to jus. Credard's neighbor is sells produce that is "100% Bio" and includes a selection that complements what you may not find at Mr. Credard's stand. Here the majority of the products keep with the season and the two vendors ensemble make for a cosy corner of veggie goodness. 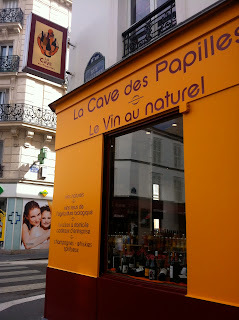 Another advantage of the Marché Mouton-Duvernet- and an argument for making the trip there if you don't live in the neighborhood- is its proximity to La Cave des Papilles , one of my favorite natural wine stores, where the entire selection is hand picked and chosen based on relationships with independent, authentic natural wine producers- who use little to no sulfites and take the concept of vin naturel very seriously. Among the many choices of wine you will find at La Cave des Papilles (including magnums of natural wine starting at 40€- awesome), you will find La Lunotte one of my favorite discoveries from a recent trip to the Loire Valley.